Overview: Berbers are the indigenous ethnic group of North Africa west of the Nile Valley. They are continuously distributed from the Atlantic to the Siwa oasis, in Egypt, and from the Mediterranean to the Niger River. Riff is a mainly mountainous region of northern Morocco, with some fertile plains, stretching from Cape Spartel and Tangier in the west to Ras Kebdana and the Melwiyya River in the east, and from the Mediterranean Sea in the north to the river of Wergha in the south. 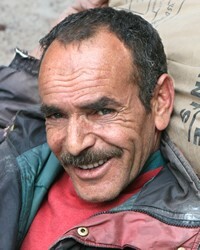 The Berber-Riff people cluster encompasses Berber people groups inhabiting the Riff region.